This little mushroom girl is adorable. I have been coveting her, and this book, for months. She is even cuter on the inside of the book than the cover promises. This is a new twist on the old tale of someone trying to reach the moon. 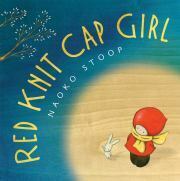 Little Red Knit Cap Girl gathers with her friends Hedgehog, Bunny, Bear, and Squirrel to help pass the moon a message. They start by making newspaper lanterns to attract the moon's attention. Since the author's inspiration for this book was participating in Earth Hour, you can guess how they are able to contact the moon. After reading this book my children and I took a walk to an unpopulated area to see the stars, and they were quite pleased with how much brighter our friends in the night sky were without manmade competition. Breathtaking, really. The visual presentation of this book is just as breathtaking. The texture given by painting on top of plywood just gives an extra oomph to already lovely colours. All the characters are as adorable as the title character, without being sickly sweet (I am pretty sure the lack of pastel helps with that!). I love when the publisher invests in a great inside cover and this time there is a double bonus. The inside cover is rich and textured and there is another illustration under the dust jacket which makes me very happy for a hardcover edition. I've often lamented that the problem with picture books is they are shut away so you can't see the art all the time. Luckily the author also has an Etsy store so you can buy prints featuring Little Red Knit Cap Girl and have her on your walls all the time reminding you to turn off the lights (and looking adorable!). I bought the bicycle print and once I can find a frame large enough, I want the Oak Reading Room print too. Which one would you buy? Aw sounds wonderful. And I love the activity you chose to do afterwards. I love the shop. Such pretty stuff. It is all so pretty, hard to choose!